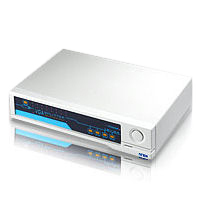 The VS134 4 Port Video Splitter from Aten is a boosting device that duplicates a video input signal to 4 video outputs each at 350 MHz, and is ideal for any monitor using analog signals. The VS134 also extends the transmission distance up to 65m (210 ft), making them excellent for public broadcast systems. Useful applications include: financial display of stock market information, educational remote display of lectures to lecture halls and classrooms, or business display for video conferencing and/or demos. In addition, the VS134 is daisy chainable and includes an AC 9 volt adapter.